Winter – long, cold, busy days demand easy,nutritious meals ready and waiting for us when we get home from work. This is the perfect time of the year to use our slow cooker. I have mine out almost on a weekly basis, not only enjoying the convenience of this great piece of equipment but also the delicious results of a long slow cooking method. I have already made Beef Short Ribs in a Stout Sauce; Curried Pumpkin Chicken Soup and Steel Cut Oat Porridge with Dried Cherries, to mention just a few recipes used within the last month. There are many different types of slow cookers on the market today, making it a good idea to read the instruction manual when you first get yours. The setting temperatures and times may vary according to manufacturer. To qualify as a safe slow cooker the appliance must be able to cook slow enough for unattended cooking yet fast enough to keep food above the danger zone. In general, Low setting on a slow cooker = 190 degrees F and High setting = 300 degrees F.
When using a slow cooker, follow these guidelines. Start with fresh or thawed meat–not frozen. Use chunks rather than large cuts or roasts. Use pieces of poultry–not a whole chicken. Cook meat on high for 1 hour and then turn cooker to low–rather than cooking on low for the entire length of time. Only use recipes that include a liquid. Cooker should be ½ to ¾ full for best results. Check internal temperature to make sure food reaches 160°F. Do not delay starting time. Do not reheat foods in slow cooker. We sometimes have callers concerned about the safety of their slow cookers. To determine if a slow cooker will heat food to a safe temperature, fill the cooker with 2 quarts of water. Heat on Low for 8 hours or the desired cooking time. Check the water temperature with an accurate thermometer (quickly because the temperature drops 10 to 15 degrees when the lid is removed). – The temperature of the water should be 185° to 200°F. Temperatures above this would indicate that a product cooked for 8 hours without stirring would be overdone. Temperatures below this may indicate the cooker does not heat food high enough or fast enough to avoid potential food safety problems. All cook times are approximate. Appropriate cook time varies according to specific meat characteristics for fat content and connective tissue as well as other ingredients added to dish including liquid, size of meat cubes, type of vegetable, size of vegetable dice, how slow cooker is filled, etc. Hi, the starting the crock pot on high always applies. Since the crock cooks at a low temperature, we want it to get to that temperature as quickly as possible. I would think that cooking for an additional 6 hours would work for the five pound roast and cut in half it would take maybe an additional 4-5 hours for cooking time. Not a longer time for carrots but vegetables take longer to cook than the meat. Additionally, they should be placed at the bottom of the pot and the meat placed on top of them. Don’t forget the liquid as that makes the cooking so much more effective. Hi, brown first if you like. Put the meat on for the first two hours on high and then cook an additional six hours. Remember to add liquid to the pot to ensure tenderness of the roast. Also liquid in the pot allows the cooking time to be more effective. Hi Sandra, start the chicken on high for the first two hours. Then reduce it to low for an additional 4-6 hours. Be sure to use some liquid or broth in the pot for the pot to cook efficiently. I plan on making pulled pork tomorrow, so how long should I cook my pork shoulder roast, in my crockpot, if it is 4 pounds and no bone? Hi remember to start the pot on high for the first two hours and then cook for an additional six hours on low. I have a 1.8 pounds of chuck roast meat and was wondering how long to cook it in a crock pot? And also should I cook it on low or high? Hi, you will want to start the roast on high for the first 1 or 2 hours and then turn it to low for an additional 3-4 hours. When I make chicken breasts or pork chops in the crock pot, the meat is always too dry. I was wondering what the proper time for pork chops or chicken breasts should be in order to avoid overly dry meat. Hi, are you using liquid in the crock pot? Added liquid ensures that the pot transfers heat efficiently from the crock to the food. Additionally, it will help meat retain moisture. Fill the crock 3/4 with food and liquid. 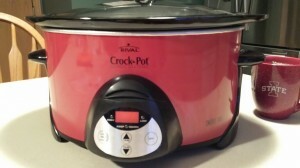 How long should I cook a 6lb pork roast in crockpot? Hi Candice, start the roast on high for 2 hours and then reduce to low for an additional six hours. Remember to add liquid to the pot so that the heat can transfer efficiently from the pot to the meat. Enjoy. Cooking a 3.5 lb pork loin in the crock pot, should I sear first and then cook on high for 5 hrs? Yes, that should work well. Don’t forget to add liquid to the pot. Hi Liz- I’ve never done a 5.75 lb beef roast in crock pot before. Should I sear? How much time on what setting? I’m also worried that the long cook time will over cook veggies. In thinking of using a bag of frozen stew veggies, perhaps that will help…. Hi, searing before will add flavor. I would suggest thawing the vegetables and adding them to the pot in the two hours. We have recently tried twice to cook a 3 pound Chuck roast using the same technique, one hour on high and 3 to 4 hours on low. For some reason both times the roast didn’t break down and become pull apart soft, instead it was tough and solid. The meats internal temperature was 174 . What could be going wrong, this process had never failed us until now. Thanks for the great info! Love that you answered all my questions in one post and love the charts. Saved your post for future reference! Hi, you will want to cook the roast for a longer period of time, 5-6 hours perhaps. Also, be sure that there is enough liquid in the crock pot to transfer heat efficiently and also to provide steam to break down the connective tissue in the roast. It is the connective tissue that can make a roast not very tender. Hope this helps. Thank you! First Time I have fully understand this fully. You have done a great job! Can I cook two (4lb each) corned beefs in my 6 quart crockpot – one on top of the other? Yes, you can, or stack them sideways so they are both touching the bottom of the pot. Hi, it is a bit harder to predict how done foods will get in the slow cooker. I’d start on high for the first hour or two and continue to cook on low for the remaining time. Perhaps a total cook time of 4-5 hours? I have a 7 quart crock pot. Will that work for a 9-10# pork shoulder? How long would I cook it for pulled pork? Just curious, what is the difference between cooking something at 190 degrees in a crock pot vs a covered 3 or 4 quart sauce pan or dutch oven in an oven at 190 degrees? I have a 6lb chuck roast that I seared then put in the crock pot with beef broth, and some other deliciousness. I put it on low for 8 hours but then my mom said that for that size meat to put on high for 5 hours instead. I don’t know what to do.. help! You should be fine if you start on high for 2 hours and then the additional 6 hours of cook time at low. Hi, the difference is that something in the crock pot is cooked in a liquid, which transfers heat much more efficiently than the dry heat in an oven. So the roast in the crock pot is cooking at an effectively higher temperature than the one in a roaster in the oven. How long do I slow cook a 0.81KG pork loin for? Hi Stephanie, start the slow cooker on high for an hour and continue to cook for an additional 3 hours on low. Hi, start the roast on high for the first 2 hours and then continue for an additional 6 hours on low. Be sure to include enough liquid so that the pot is 3/4 full with both the roast and liquid. This will allow heat to transfer efficiently from the pot to the meat. This resource is wonderful!!! I think I could approximate from the comments above, but I was wondering if it might be worth being a little more accurate ;-). I have a beef roast that is 9 pounds (two pieces, actually) and I want to cook it in my 6.5 liter crock pot. How long should I cook it? Hi, please start the crock pot on high for the first 2 hours and turn down to low for an additional 6 hours or so. Remember that adding liquid to the pot will allow it to transfer heat more efficiently and cook the roasts better.